(CelebrityAccess) November 3, 2014 – Proving that everything new can be old again, pianist and arranger Scott Bradlee has become a viral pop sensation after creating a series of clips for YouTube that finds him and his ad hoc group Postmodern Jukebox reworking 21st-century pop hits in a variety of vintage styles. 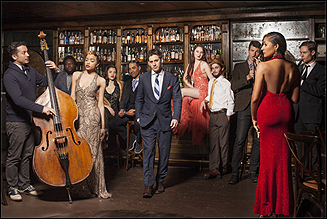 The success of these re-imagined arrangements have made Scott Bradlee & Postmodern Jukebox’s tour one of the most talked about of the season and one of the harder concert tickets to obtain. After selling out shows in NYC, Philly, Boston and other east coast stops, the ensemble brings its variety show performance to the west coast with nearly all sold out dates that include Phoenix, Tucson, San Diego, Agoura Hills, Anaheim, San Francisco, Portland, Seattle and Napa Valley. In addition, Los Angeles fans can still catch the group perform at Hyde Sunset Kitchen for a select number of Wednesday night performances, before the speakeasy residency concludes on December 10th. The Hyde “immersive” experience varies quite a bit from the touring show with the entire showroom at Hyde becoming the stage; the lines are often blurred between audience and performer. Videos from Scott Bradlee & Postmodern Jukebox have been viewed on the ensemble’s YouTube channel well over a hundred million times, with his 1940’s style jazz interpretation of Meghan Trainer’s hit single “All About That Bass,” garnering over 10 million views alone. Clearly, so does everyone else, as evidenced by Postmodern Jukebox’s tickets sales success (stateside and abroad.) “It’s a variety show, a musical revue featuring special guests,” Bradlee illuminates. “Coming to a PMJ show is like time-traveling back to Old Hollywood – it’s an experience.” Creating that for audiences appears to be PMJ’s ultimate mission.